CHILD HEALTH AND DEVELOPMENT CAMBODIA ORGANIZATION operating THOMAS’ HOUSE. We have developed this small booklet to tell you a little about our work and the environment we work in. We ask that you read this booklet before you make any decision to visit us, as some people may find our working and living environment “somewhat challenging”. Volunteering can be an enriching experience for people who come to us with an open mind. If you do make the decision to visit us we hope you enjoy your experience and tell your friends and family about our work. 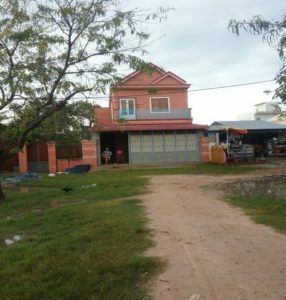 As a registered Non Government Organization (NGO) in Cambodia, CHILD HEALTH AND DEVELOPMENT CAMBODIA ORGANIZATION manages Thomas’ House in Sen Sok, an outer suburb of Phnom Penh. Thomas’ House has been established for children recently released from hospital, and their families, who require free, continuing medical, non hospital care for a short period while the child either returns to normal or near normal health or during the last stages of a terminally ill child’s life. Any child whose parents are unable to afford any kind of medical care and or food are also our focus, as are disabled and abandoned children. Basically, we are a care facility and service but don’t worry if you feel unable to provide nursing care, as we have a resident nurse at Thomas’ House. Any person willing to give hugs and attention to the children is most welcome. Some children may come to us on a daily basis, others may stay with us for a time. Occasionally, a parent may stay with us while their child is receiving our care. Our mission is to source, develop and deliver care, training and therapy that will meet specific needs of our paediatric clients, their families and our staff in a supportive and caring environment. We are a registered Australian Charity as well as being a registered NGO in Cambodia. Neither of these status’ attract any government funding so we rely on donations to provide funding for the work that we carry out seven days a week, twenty four hours a day. Our work is varied, children and their parents present to us at all hours of the day. At times it is very busy, at other times we are able to relax and rebuild our energy. Please understand that we cannot guarantee the number of children we are caring for at the time of your visit. What we will endeavor to do is to make your stay with us as interesting as possible. We currently offer a Breakfast Club where children under 12 years old can come to us and have a bath, hair wash ( to delouse them), fruit, drink and bread or rice, teeth cleaning and some simple play activities. A basic health care service is also provided at this time for the children to have their wounds , headaches, earaches or sores treated. Sometimes we have many children present for this program, other time we nhave none. This program has been augmented by our “Feeding the Future” Food Program consisting of a cooked midday meal. In association with this program we undertake welfare checks on the older recipients so that we can provide medical assistance to these people if required. 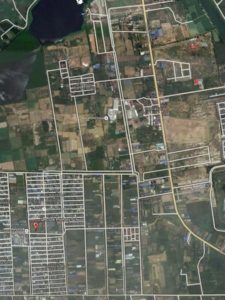 We hold outreach Clinics in rural Kampong Speu, approximately one to two hours ( depending upon traffic and the state of the roads) from Thomas’ House. If you are interested in accompanying us to one of these Clinics please email for our Schedule of visits. Our Directors are currently ( December 2016) in negotiation with the Royal Cambodian Government Ministry of Health to allow us to hold a Primary Health Centre at Thomas’ House as well as at a local Hospital. If you do make the commitment to volunteer with us, we have the following rules that must be adhered to. Child safety is of paramount importance to us and we feel that these few requirements will assist us to determine whether you are a suitable person to be accepted into our program. A copy of your passport page showing your Name, photo and DOB. Name and contact details of your emergency contact person. Please email this to us prior to your arrival . We most strongly suggest that you take out Medical Insurance during your visit to Cambodia as Thomas’ House takes no responsibility for payment of your medical bills. We suggest that you have sufficient funds to support your activities, travel and medical insurance or possible expenses if you should fall ill.
We require that your clothing holds no political slogans, is culturally sensitive and does not expose body parts. Low neck tank tops would be unsuitable, as are very short shorts. We require that any volunteer working with a child must always be within sight of a staff member. This is for the protection of the child as well as the volunteer. No drugs should be brought into our premises. No person should be under the influence of drugs or alcohol while at Thomas’ House. The Directors of Thomas’ House reserve the right to request you to leave Thomas’ House should they consider that your actions are not supportive of our goals or mission. Cambodia is a developing country and as such, presents many challenges to the traveller. HIV/AIDs is widespread throughout the country. TB is the largest killer of people in Cambodia. Malaria, Hep A, B and C and bacterial infections are common. Please discuss your situation with your doctor prior to travelling to the country. Sen Sok is approximately 15 klms from the centre of Phnom Penh City. If you are travelling from the city the best way to travel is by Tuk Tuk which is a motorbike with an attached, covered trailer that seats four people. A word of warning… many Tuk Tuk drivers will nod their heads when you ask “ Do you speak English”. Ask a different question such as “Do you know the way to Sen Sok? How far is it?” You will be able to filter out the non English speakers this way. Once you have chosen your driver, ask him to travel down Ha Noi Street as this is the easiest way to find us. The trip from town will cost anything from $7-$10 dollars one way. Please negotiate this with the Tuk Tuk BEFORE you begin the journey and agree on a price , as you may be subject of a scam driver who wants to charge much more than this. While travelling in any Tuk Tuk, always protect your belongings by hanging onto straps, move items away from the sides of the Tuk Tuk, ensure your purse or wallet is out of sight and never use your phone while travelling- it is a common occurrence to have phones snatched from your hands. If you use Google maps, type in Sen Sok Primary school. We are only 200 metres from there. If you don’t use maps it is a little more difficult. If your Tuk Tuk does not know the Primary School, stop near a recognizable land mark , ring us and we can guide you. But make sure you travel along Ha Noi Street. To assist you to find the turn from Ha Noi Street, we have included a photo below for you to refer to. If you wish us to, we will text you a photo of the street intersection once you confirm your arrangements. We make it sound difficult, but is quite easy once you know how!! These two photos show landmarks for you to watch for as you make your way along Ha Noi Rd. 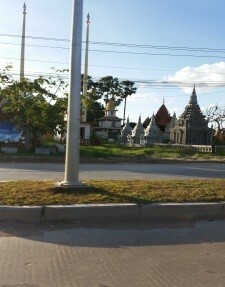 Travel several kilometres and you should see a large and sometimes untidy Pagoda on the left hand side of the road. You will then observe the stone masons making beautiful statues of the Buddha and various other Cambodian figures as you travel Ha Noi Road. Further travel on Ha Noi Rd will reveal more stonemasons. 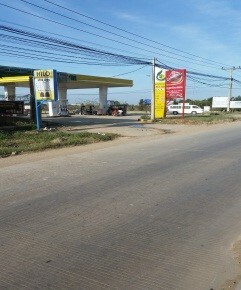 Approximately two kilometres past the Pagoda you will see this Gas Station. Turn left here. Follow this street until you see a very large, modern building on the left. This is the International University School. Turn right just before this building until you come to Sen Sok Primary School. Coming from the Airport is similar. At the Arrivals Corridor there is a Car Hire booth on the left hand side. You tell them where to take you and they have a flat rate $12 charge which you pay to the driver. If you do not wish to pay this much, then walk OUTSIDE of the airport grounds… about 100 metres across the car park and hail a Tuk Tuk. Costs should be similar to above. 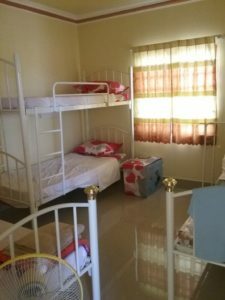 At Thomas’ House we have a dormitory style bedroom which sleeps up to six people in single beds. We can separate the males and females if required by utilizing an adjacent lounge room. Beds are basic, all have new foam mattresses and sheets and pillows. We have an unreliable electricity source but fans are available and a good night’s sleep can be had while the fan is running. Wifi is connected to Thomas’ House. We have two bathrooms. One has a hot water shower, the other has cold water. The bathrooms both have a western style toilet with the difference being that no paper can be placed into them. 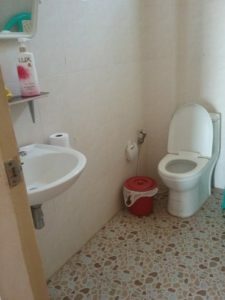 A bucket beside the toilet is used to hold used toilet paper. Not something any of us are used to but that is the way it has to be.. you soon get used to it. .We have a small, very temperamental washing machine that is available for your use but we ask that you do not place heavy items in it. Security in Thomas’ House is excellent as we have heavy security grills on every window and doors are sturdy metal. We have screens on every window but mosquitoes still make their way into our house to annoy us. Please let us know prior to your arrival if you wish to have a mosquito net over your bed. We are an hour away from Western supermarkets. Any food we are able to purchase in Sen Sok is typically Khmer. If you have a dietary requirement please discuss this with us before you come to us. We don’t guarantee that we will be able to meet every dietary need. You will typically be sharing your room with other volunteers. Please ensure that you keep all of your valuables under lock and key as we accept no responsibility for any losses you may incur. Travelling at night in Cambodia presents some risks, so for your safety, we ask that you arrive at Thomas’ House between the hours of 7am to 4pm. 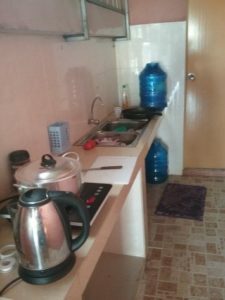 For those people arriving in Phnom Penh City by air outside of those hours, there are several Hotels in the vicinity of the Airport for you to stay. Phnom Penh City is home to numerous Hotels that readily accept online bookings. Use one of the many booking services to secure your accommodation if necessary. All transactions are charged in USD. We want you to enjoy your stay and promise not to work you too hard! Your typical day would be to finish breakfast no later than 8am. This time allows us to have the kitchen cleared ready for the children’s meals. You will then be ready to accompany the cook while she shops for our food. This visit to the market is a memorable experience with sounds and sights not likely to be experienced in your home country. Please be considerate of the local people and always ask for permission to take photos. Many of our locals do not like being photographic studies and may become upset. NEVER pay for a photo . The most effective way is to purchase something from the person and then ask permission to photograph them and their stall. If you wish, you will be able to assist the cook prepare the midday meal, which you and the children will eat together. Alternatively, you may observe or help in our Clinic, or travel to our outreach programs. We are located near several International Schools and these facilities would welcome a native English speaker as they are anxious that their children become proficient in the English language. You can travel into Phnom Penh any time you wish. Just tell us and we can arrange for a Tuk Tuk to take you, at your cost. If you suffer from a medical condition or emergency while you are with us, you have several options. Our nurse will provide initial care and determine whether you should seek medical advice. Your options regarding this will be explained to you and it will be your decision as to what option you follow. Any medical care will be at your cost. If you visit us for a few hours, please consider making a donation. If you stay and eat a meal with us we ask that you pay $5 for each meal. If you wish to stay with us we ask that you pay $10 per night. This cost covers food, utilities and accommodation. This fee should be paid on the first day of your visit. ARE YOU READY TO VISIT US AND EXPERIENCE THE JOY OF GIVING LOVE AND SHARING YOUR LIFE? If you feel that you wish to visit for just a few hours, or stay with us, please contact us on thomastransitionhouse@gmail.com , by phone on 0969031450 or 0969031670 ( Cambodian mobile numbers) or by sending us a message on our Facebook page Thomas’ House. Child Health and Development Cambodia Organization. Sangkat Kmownh, Khann Sen Sok, Phnom Penh.